So, if you clicked on this post, you just want to know one thing. The answer is loggers and people in logging-related professions. That is, logging equipment operators make up about 11 times the share of total employment in Maine as they do nationally, according to the Bureau of Labor Statistics. Vox and Business Insider, which specialize in these “what’s the best/worst, most/least” in every state maps, have broken down those numbers in previous posts (Vox’s headline is more accurate. I’ve not done another run-through of the two slightly different results, but both link Maine and logging, so there you have it). That Maine has an outsize number of loggers compared to the rest of the nation, given that Maine has so many trees. The most in Northern Forest, in fact, both in per-person and overall totals. 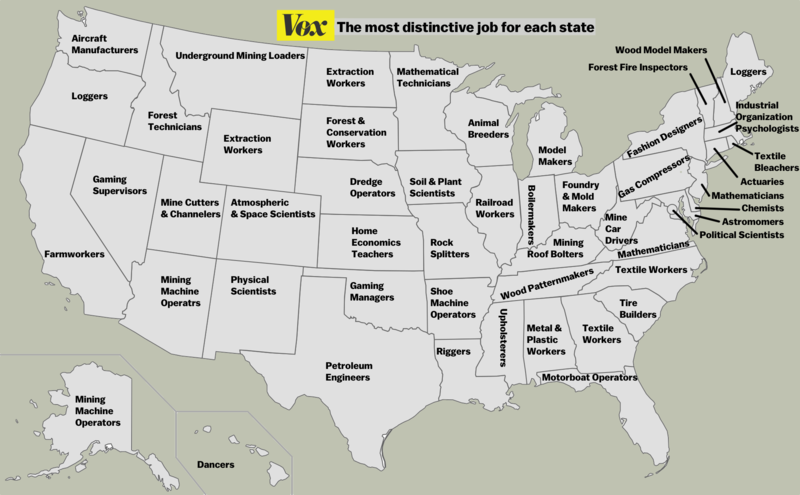 Forestry is well represented in all of the state’s most distinct occupations. The total for logging and equipment operators is top, followed by forest fire inspectors and prevention specialists, log graders and scalers and then… political scientists. Go figure. Here’s the full location quotient list for Maine.